I don’t want to let National Poetry Month go by without posting a poem. It’s been a challenging month for computer time for me, but I’ve thought several times of posting a poem. One always comes to mind that I wrote in February, after the sudden death of early childhood educator, Bev Bos. Bev Bos was a longtime director and teacher at Roseville Community Preschool, an autoharp serenader, an author and captivating speaker, and a champion of play-based learning for preschool-aged children. She was a great inspiration to my son’s wonderful preschool, El Cerrito Preschool Co-op, and to me, as both a writer and a mom. Bev knew young kids. She knew what motivated them and what is important for them. She helped me see how crucial it is for very young kids to experience their own power—their ability to impact the world physically and socially. So often when I would hear her thoughts, even if they were a bit novel, they rang with truth. For example, she believed that taking turns is not developmentally appropriate at preschool age. From her influence, at El Cerrito Preschool Co-op we tried to have plenty of everything, but when there were limited resources, like a special swing, we’d have the kids sign up to take turns that weren’t time based. A turn lasted until the child was done. I want to share my poem, Thank You, Bev Bos, in gratitude for Bev Bos’s contributions and in honor of National Poetry Month, for a number of reasons. First, Bev’s talks and writing have helped me understand my audience when I write for young children—I particularly think of Bev when I think of the simple yet powerful sentence on the page with bubbles in my book, My Amazing Day: “I popped it!” Second, when I was feeling jarred by the shock of Bev’s death, I found that writing a poem helped me calm and ground, as writing poetry so often does. And most of all, the joy and freedom of play depicted in the poem and inspired by Bev Bos reminds of the feeling I have when writing poetry is at its best. Maybe I have some play-based education during my own youth to thank for that. Train tracks go ‘round me. I might swing all week. 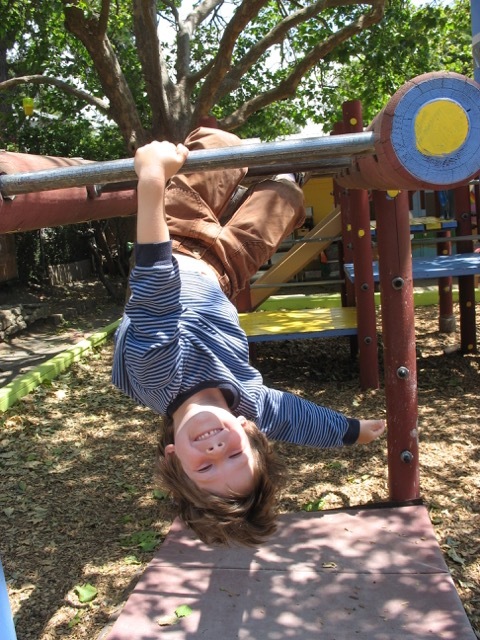 You can learn more about Bev Bos’s approach to play-based learning through her books. My favorite is Tumbling Over the Edge: A Rant for Children’s Play by Bev Bos and Jenny Chapman. This entry was posted in creativity, Karin's poetry, My Amazing Day. Bookmark the permalink. This is lovely, Karin, and as a long-time teacher, now a grandmother of three, two younger granddaughters and an adolescent grandson, I know also of Bev Bos and some of her work. Much has been shared/written recently about the value of play. Some of my colleagues who teach the primary children tell me that they also need to teach how to play, that wonder and curiosity. I enjoyed your post, glad you found time! Thanks, Linda! I like knowing that you know of Bev Bos, too. I’ve been glad to see more about play out there lately, too. What a lovely tribute to Bev Bos–it sounds like she was a terrific educator. I wish I knew what you learned from Bev about preschoolers. Sch a lovely post to your dear friend. Thanks very much, Patricia. I didn’t know Bev personally, but we all referred to her by her first name. I think because she shared so much of herself when she spoke. The preschool hosted a talk by her each year. If you want to learn from her still, I do recommend her books, particularly Tumbling Over the Edge, which is the most recent. Even though they are aimed at teachers, I think any of us who want to understand young children better have much to learn. This is wonderful! I recognize the name… think my mom may have had a book of hers when i was growing up. If so, then I guess I have to thank her for some influence on my upbringing too! Thank you! Great to “see” you here. I love the idea of your mom reading Bev Bos’s writing. I can see her being really taken with it. I also love the idea of you being influenced by it and when I think of your influences on my own creativity, that just makes a lovely circle. Wonderful poetic tribute to Bev and what she stood for. You’ve captured the childlike exuberance and expansiveness of play and creativity so well in your poem. Thanks, very much. I’m so glad to hear it struck you that way. Beautiful tribute to a woman with an important message for the world! Yes, indeed–an important message. I think she started some great ripples that are going and will keep going. Great job capturing the maneuvers of a preschool mind at play!